Make sure that you pay for what you expect. Dig deeper into the past by getting a free vehicle history report for an associated Connecticut license plate number. You may also seek out the Connecticut DMV’s database for vehicle data. Request information to learn about vehicle details unavailable from other sources. If you have inquiries, you may contact at 860-263-5700 / 800-842-8222. You may also visit the Contact Us page. You have 60 days to transfer your vehicle registration to the state after establishing your residency. Some vehicle types must undergo a VIN verification to register, while vehicle units that are older than 20 (model) years old are not required to be titled. Most vehicles are required to undergo an emission test, but some vehicles can be exempted from this rule. The Connecticut Division of Motor Vehicles provides plates with three letters and three numbers for passenger cars. Each car must hold two plates: the front and the rear plates. Request replacement plates online if your current plate is damaged or missing. Take note of the additional requirements the DMV may ask for, such as police report, in case of stolen plates. There are eleven (11) types of plates being issued in the state of Connecticut. Please be aware of the requirements for each style of plate. Special plates can be requested through an online application, or by filling out the application form. You can request the transfer of a license plate in Connecticut. For further instructions on how a license plate transfer is processed in the state, you may visit the Transfer Your Plate page. The title is usually provided a month after the registration is completed. An additional 90 days are provided for a free re-application if the title’s not acquired within the given time. The DMV will provide a new title within a 30-day period upon receiving a notification that you did not get the title. In addition, a title is not required to operate vehicles older than 20 years of age. The lienholder gets the title if the car has a lien. The same rule applies to replacement title requests. To avoid these scenarios, be sure to remove any existing lien before proceeding with your request. You may request a replacement title at certain DMV offices near you. Follow the instructions correctly to ensure that your request is processed smoothly. An application via mail might take approximately three months or 90 days to complete. If you wish to request details found on a vehicle’s title records, such as its odometer readings and original specifications, fill out the Title Records Request form and submit it to the address indicated above. Check out the Title Services page to know more how vehicle titles are handled in Connecticut. Buying a used car in Connecticut? Don’t make a costly mistake. 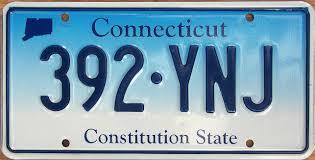 Run a Free License Plate Lookup for your Connecticut-registered vehicle! Run a Free Connecticut License Plate Lookup to uncover the full-story of your Connecticut-registered vehicle.